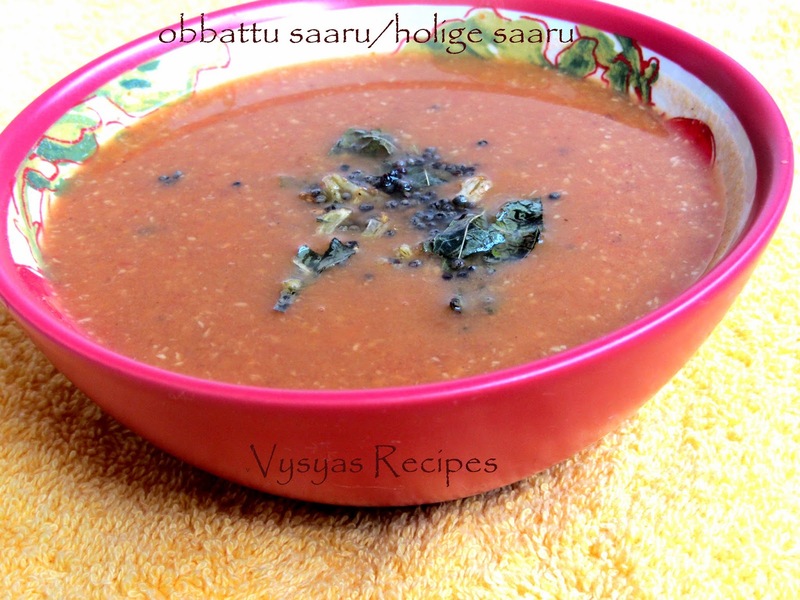 Obbatu saaru is a Popular Rasam Made in Andra and Karnataka during Festive Occasions. Obbattu saaru is made with leftover Hoorna(obbattu/Holige poornam.) It is mainly made during ugadi festival.Tanginess of Tamarind and sweetness of jaggery when mixed with lentils makes rasam tastes awesome. Now we will learn to make Obbattu saaru with simple steps. Hoorna - 1/3 cup or 2 balls. plz refer my obbattu/Holige Recipe for further reference]. Rasam Powder - 1 + 1/4 tsp. Crush the garlic and curryleaves together in Mortar and pestle. put the tomato in boiling water, let it boil till tomato is soft and it has crack in the skin. Then remove the skin of tomato. put the tamarind in 1/2 cup of water for 1 hr to prepare tamarind extract. throw the pulp and retain the water. Take a wide Vessel, squeeze the boiled tomato.Add tamarind water, hoorna, rasam powder, 1/2 cup of water and salt.mix everthing.check for taste. [Add rasam powder, salt and water according to your taste buds]. Boil the saaru mixture in a pan for few minutes till raw smell goes. Remove from flame.Garnish with coriander leaves. Finally heat the oil, add mustard when it splutters add crushed curryleaves and garlic and hing. saute till garlic turns golden brown colour.Finally add it over saaru. Now Holige rasam is ready. Thick and creamy rasam, will try this. rasam looks totally comforting and flavorful..
Easy to make traditional dish. Superb.. Very new and interesting Rasam recipe...will try this for sure!